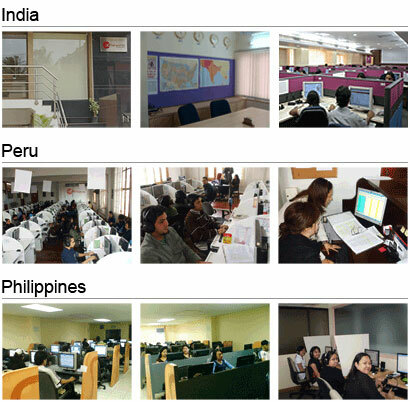 At Outsource2india, we follow a 3-tier architecture for the network within our call center infrastructure. We have a redundant L3 core design and the servers terminate into the core through redundant connectivity. We have network fabric with port level physical redundancy and 384 active ports per floor. Our network transport and Internet is comprehensive and reliable. Our call center infrastructure has an inbound voice solution that is based on the Cisco IPCC (Internet Protocol Contact Center). O2I's call center infrastructure has a distributed dialer architecture and is tightly integrated with Cisco voice solution. Our predictive dialer has 2:1 pacing and real time calling list management. Witness, the largest call center software company created an application suite for us. We have deployed this suite for contact capture and quality monitoring. Customer id, Caller Entered Digits, DNIS, ANI, Disposition Code, Talk time, etc. To track compliance issues, security of information and provide feedback to our agents and improve the customer service experience for your customers on a regular basis we need to have authentic and extremely clear data. We at Outsource2india, have the provision of 100% recording. This allows us to track each and every call that each and every agent makes or receives. We have been in the outsourcing industry for over 20 years now and have worked on multiple inbound call center service projects. Our refined and well-networked call center infrastructure allows us to keep our standard of service soaring to make your business flawless and impeccable. Contact Outsource2india to make our technology work for your Call Center.